So here’s the story of my life these days I’ve been off all sugar for about one and a half months. And I don’t mean just the white powdered sugar, I mean all sugar …. honey, maple syrup…even A PIECE OF FRUIT sugar. To be quite honest it has been a road of reflection and discovery of my habits, and families life habits. About 5 years ago I went completely refined sugar-free – meaning candy bars, or anything that came straight out and said SUGAR, brown sugar etc. In replacement, I added in honey, coconut sugar, maple syrup. Let me say something those things aren’t bad in moderation but I had to be clear with myself that I was addicted to “healthy” sugars. After years of being a full-fledged vegan, my go-to meals were smoothies with banana and tons of sugar. Once again this can just completely fine for the normal person with a healthy gut. I’m not going to go into my life story at this moment but I can say I’ve suffered from Candida without even realizing it. What is Candida – it’s an overgrowth of yeast. An overgrowth of yeast that THRIVES off of sugar or anything that even breaks down to be complete sugar. It’s been a journey of getting clear and healing. Here is where the golden milk paste/concoction comes in. We were traveling for Thanksgiving a time where I have put myself on The Body Ecology protocol in order to heal. Which really meant no sweets to me – even my healthy fruit sweetened pies. I honestly didn’t even want to talk about this on the blog – I just wanted to heal in silence. Then I remembered the beginning of my journey and do you know what helped me?! Reading my favorite blogger that I looked up talk about their own journey and I didn’t feel so alone. I had a place to go for recipes and a place for inspiration and a sense of community. So here you go – there’s the beginning of the story so for awhile I’ll be posted even more healing recipes and maybe some sweetened with dates and honey. Don’t worry – I have a special recipe tester for those recipes ;). Now back to talk about Golden Milk! we were traveling back to Wisconsin for Thanksgiving with my boyfriends family and his Mom started to mention a golden milk recipe for a paste. I have always loved golden milk but I usually reached for the blends that were just the powders. What is different about the paste/concoction is you can just reach into the fridge and grab a couple spoonfuls from your mason jar and whisk to serve. It also has coconut oil in it which help your body absorb the crazy amazing benefits of golden milk. I came home from our trip and started to make the blend and grabbed a jar of pumpkin spice instead of nutmeg and added it in. To my surprise, it tasted fantastic. 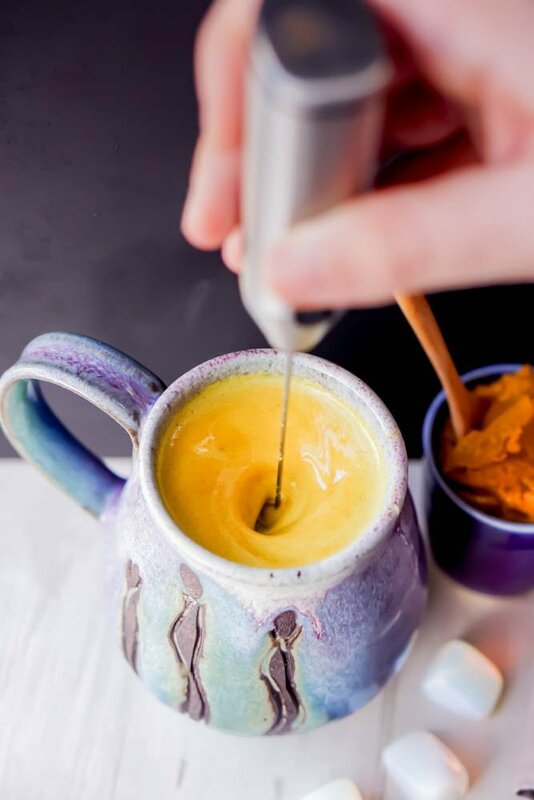 Golden Milk, in general, is delicious so feel free to leave out the pumpkin spice blend and just add in nutmeg. We are now hooked on this recipe as our every night dessert. He will add in honey and I add in the Lakanto Raw Monk Fruit for a sweetener. p.s. if you don’t want to mix all the spices together feel free to use Moondeli’s Golden Turmeric blend in place of the turmeric, ginger, cardamom, & black pepper. Therefore just add in 1/2 cup of this blend and you are good to go. Lakanto Golden Raw Monk Fruit: click here for 20% off your whole order using MYTINYLAGUNA promo code. Moondeli: use promo code LAGUNAMOON for 15% off entire order. Prepare ginger & boil water/ginger puree. Take your fresh ginger and peel off the skin than grate or mince your ginger into fine and small pieces. If you can save the juice that comes out. When done add into the hot water. Now mix all the ingredients in the water with the ginger and stir for about 3-5 minutes until your concoction is thick. Spoon your pumpkin spice golden concoction mix into your mason jar. Cool and seal your jar. Store in the fridge for up to 2-3 weeks. We finish about 1 jar per week.